Egyptian army launches Operation Sinai 2018 against jihadists in swathes of territory, including Sinai. 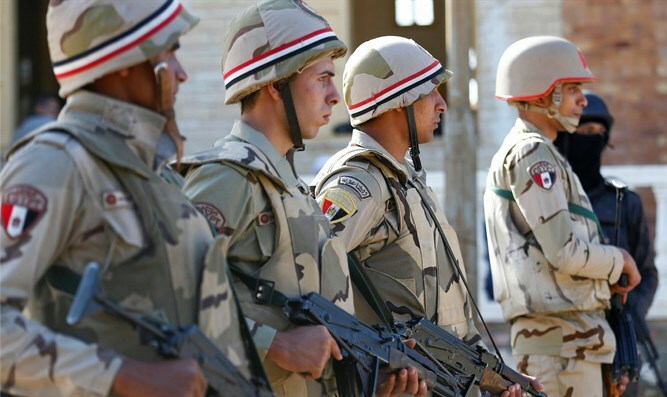 The Egyptian army on Friday announced the launch of a major operation against jihadists across swathes of territory including the Sinai Peninsula, where it has been fighting an Islamic State (ISIS) insurgency for several years, AFP reported. Police and troops have been put on "maximum alert" for the duration of "Operation Sinai 2018", which also involves the air force and navy, the army said in a statement on Friday. The goal of Operation Sinai 2018 is to tighten control of border districts and "clean up areas where there are terrorist hotbeds", army spokesman Tamer al-Rifai said in a televised address. In a later update, he said the air force had targeted a number of homes and hideouts in the north and west of the Sinai. The navy was boosting maritime border security "to cut off the influx of terrorists", he added. Also on Friday, the interior ministry announced a parallel operation against Hasm, a group which authorities have branded "the armed wing of the Muslim Brotherhood". Three jihadists were killed and 14 arrested in raids around the country that had foiled attacks aimed at disrupting next month's election, it said. Most of the attacks in Egypt since the overthrow in 2013 of Muslim Brotherhood president Mohammed Morsi have been in North Sinai province, but there have also been attacks on the military, police and even churches elsewhere, including in Cairo. Jihadists have also attacked tourists, killing all 224 people on board a Russian plane carrying holidaymakers in 2015 that crashed in the Sinai. Meanwhile, Egypt closed its border with Gaza on Friday, a day earlier than planned, Palestinian Arab officials said, after the anti-jihadist operation began. Egyptian authorities have kept the Rafah crossing with Gaza virtually sealed since a terrorist attack in the Sinai Peninsula in October 2014, though they have temporarily reopened the crossing several times since that attack, mostly for the passage of humanitarian cases. Sisi, who is expected to easily win another four-year term next month after several potential challengers were either hobbled or dropped out, said on Facebook on Friday he was "proudly following the heroism" of the security forces.